5 Reasons You Think You Shouldn't Book in a Motherhood Session. Ok, so here's the thing. Mums, you're one of the most beautiful but also most difficult subjects to photograph. You have all sorts of insecurities, worries and personal hang ups. How do I know this? Because I am you. We are united by so many similarities. Motherhood does that. Being a woman does that. So I've delved deep into my own experiences, and also the experience I've gained from photographing women thus far, to give you a little talking to. 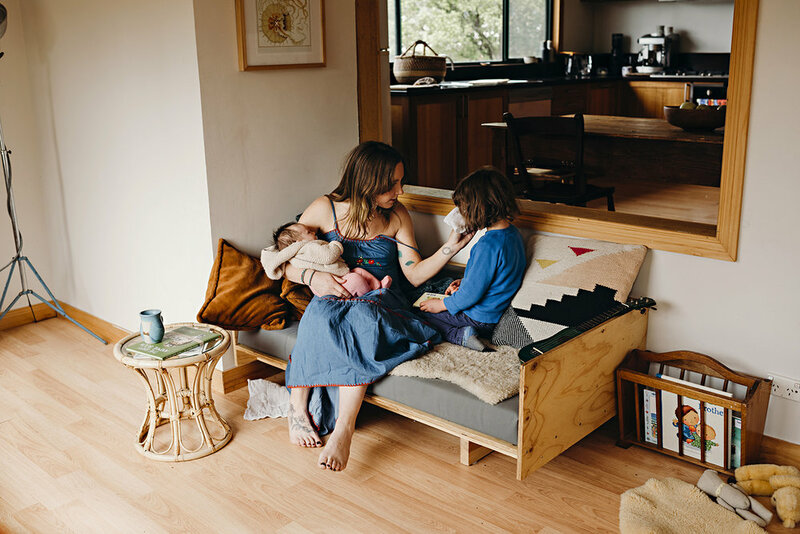 I've already harped on in this blog post about Motherhood sessions and why I want to capture your love, hard work and commitment, so I won't repeat myself. I'm just going to jump straight into these points and do my best to make you see that these sessions are worth doing; where you are now, as you are now. This one. Where do I even begin? And I can't really lecture you on this without sounding like a total hypocrite, because I say the exact same words. Here's the truth for you, when I see a photo of myself that little voice in my head says things like this: 'Let's look at your body. Do you look fat? Let's look at your legs, bum, arms, face. Let's scrutinise all the little details. Your teeth, your wrinkles, your double chin. Let's focus especially on that little bit of extra softness around your belly that's joined you since having children, and because you continue your love affair with baked goods.' WHY? Why do we do this?! Why can't we just see our radiant smiles, our sparkling eyes, or our hands that have worked hard, cared for and tended to so many chores, ailments and tasks? Why can't we focus on the love? The fact that we have love, are loved, give love. And here's the other thing (and possibly the best news of all), our children don't give a flying fig what we look like!! They're just so happy that we're there for them. Friends, I can't guarantee that you're going to adore every photo I take of you but I can guarantee you this, my eyes are intent on capturing your beauty in all its forms. Does your house have windows? It does. Great. When would you like me to come over? To elaborate a little, your home is your home. It's your place, it's where you make memories. Yes, some spaces are more photogenic than others, but that's ok. And maybe your current abode isn't where you hope to be forever, but that doesn't mean it shouldn't be documented as part of your journey. I'M WORRIED THAT MY KIDS ARE GOING TO BE TOO NOISY/CRAZY/BUSY etc. Yep. Your kids are probably all these things, and will probably be even more so because there's someone coming over. I understand this fear completely. Who doesn't want their children to be the very best versions of themselves when there's company present? You're worried that you're going to spend the whole session diffusing arguments, or calming temper tantrums, or gritting your teeth. Firstly, it's totally okay if your children act like children. I expect chaos, mood swings, and all the rest of it. Secondly, because our time together is only a couple of hours and you will spend most of it playing with them, loving them and basically giving them all of your attention, they will probably adore it! And if not, I'm pretty good at giving you space when and if you need it. Or, you may even find I'm a useful helper....I can totally keep kid number one distracted, while you deal with the baby's surprise nappy explosion. High fives! I'M WORRIED IT WILL BE AWKWARD/WEIRD/ALL THE UNCOMY VIBES. Of course you are! Because it is awkward. But honestly, only for the first two minutes or so, I promise. Plus, I'm always nervous as heck before my sessions. As in my stomach gets all knotted and my brain says: 'Run Lisa, run!! ', as I'm approaching your front door. So we're even. And don't worry, we will email each other before the session and discuss ideas for things you guys can do together, and ways to make the time run super smoothy with limited awkward pauses. Not only that, I will be guiding you along the way, encouraging you and chatting with you. It will be so chill. And if you're still not convinced, here are some kind words that were recently given to me by a wonderful Mama: 'You felt like one of the family, even though we had never met before.' Trust me. We got this. See how I put this one last? That's because I hate talking money and even more so, I hate the hard sell. Hey, I know money is a big deal, especially when you have a family, a budget, and bills to pay etc. I also know that professional photos are a bit of a luxury item. And you know what? These might not even be photos you're going to blow up big and hang on your wall, and I realise that maybe you're not prepared to pay for photos that don't include your significant other. I have pondered all these things. But at the end of the day, this a session you may only do once, and these are images that are going to last you a LIFETIME....and then beyond your lifetime. Let me just say this. If someone handed me a collection of photos from a day at home with my mum, from way back in the 80's when I was small and she was still alive, that would be priceless. Exisiting in photos is important. Documenting life is important. Busy, messy, noisy, sometimes with a double chin, often with a soft tummy. It doesn't matter. Let's just embrace your beautiful now.